Caspian horses are small originally from Iran. Although generally no more than 12 hands (1.22 metres) high, they are nevertheless considered to be a horse rather than a pony. They are a similar build to Arabian horses, and they are extremely hardy, with very dense bone and hard feet that rarely need shoeing. They can take long strides and are able to keep up with normal-sized horses while walking, trotting, or cantering, despite their smaller stature. The most common colors are bay and black, though they may also be grey, dun, or chestnut. Although the Caspian horse may have had a long history in its own country it did not really become known to the rest of the world until it was "discovered" by an American-born Iranian horse breeder, Louise Firouz, in the 1960s. 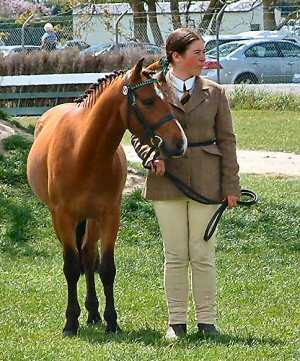 Within a few years some had been exported to the United States, and in 1976 a Caspian stud was formed in England. Since then the breed has also been established in Australia and New Zealand. They were first imported into New Zealand by Helen Rattray in the late 1970s and early 80s. Helen bred quite a few crossbreds but also 29 purebreds, a lot of these were sold to America where some did very well in the show ring and it was really these horses that were instrumental in establishing the breed in the US.